The Cooper is a farm-to-table restaurant specializing in the finest foods and beverages sourced whenever possible from local farms, food artisans, small-batch distillers, and craft brewers. Founded by noted restaurateur Richard Rosenthal, The Cooper provides a warm, upscale dining experience, mixing sustainable seasonal dishes with an innovative take on classic American cuisine. After graduating from Florida State University with a major in hospitality, Mr. Penenori has been managing restaurants for over 25 years. He has been a General Manager for several major restaurants in the South Florida area since the early 90's and is well familiarized with Palm Beach Gardens. Some of the restaurants William has managed include L&N Seafood, J.Alexander's, Abe & Louie's and Houston's. He enjoys getting involved with local charities and helping with the local community programs and looks forward to this new and exciting venture. In his free time, Will spends most days outdoors and trying new places to dine with his beautiful wife Liz, his daughter Katerina, and son Willie. 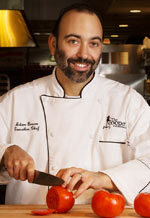 Chef Adam Brown keeps a simple philosophy in mind as the Executive Chef at The Cooper: "Food should be approachable". That's why he sources the very best local ingredients and lets them shine in dishes that are clean and have a rustic approach. His creativity transforms traditional dishes into memorable new flavors. Chef Brown has a background in French cuisine and adds Mediterranean influences in his reinterpretation of new American classics. At The Cooper, his farm-to-table driven menu will highlight small plates and signature dishes with seasonal changes. He is inspired to create new dishes that reflect the freshest flavors of the season. Born and raised in New York, Chef Brown has had a lifelong passion for food and hospitality. He attended the Culinary Institute of America and cooked at Blue Water Grill in New York City before coming to South Florida. 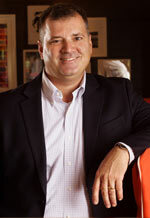 He worked at local restaurants such as "Sunfish Grill" and "Sundy House" before joining Rapoport's Restaurant Group in 2004. He began working as the Executive Sous Chef at "Bogart's Bar & Grille" and later became the Executive Chef at "Henry's" in Delray Beach. He was the opening Executive Chef at "Burt & Max's" in 2013, helping the bustling restaurant receive rave reviews and packed seats. At The Cooper, Chef Brown brings his years of experience and leadership in the kitchen with an ambitious menu that will please all types of palates. Chef Brown has twice been on the winning team at the Delray Beach Garlic Festival, and he was recently called a "Chef You Should Know" by Delray Beach magazine. In his free time, Chef Brown enjoys going to concerts and the movies and is always ready for a Yankees game. His best moments are spending quality time with his wife Robyn and his 3 year old daughter Harper. 249 Pearl Street, 2nd Fl. Sunday - Thursday: 4:00 p.m.-10:00 p.m.
Friday & Saturday: 4:00 p.m.-11:00 p.m.